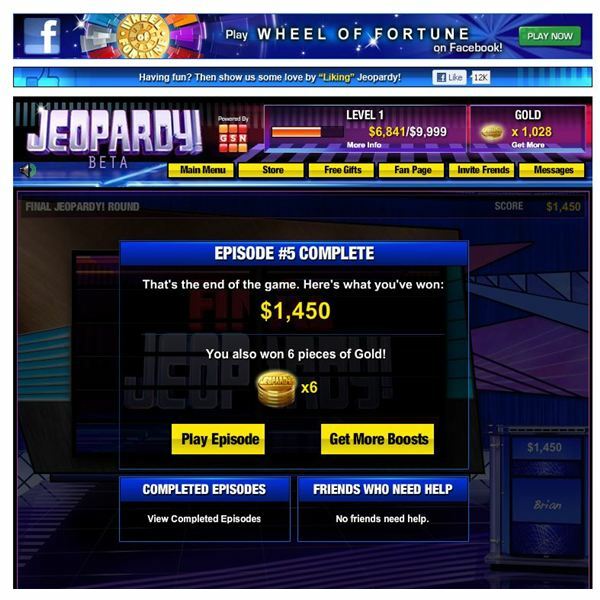 In Facebook Jeopardy, players get ‘episodes” which are free plays of the game each day. You can get additional episodes with game cash if you like. After eight hours, you will get an additional episode fro free if you have played within those eight hours. 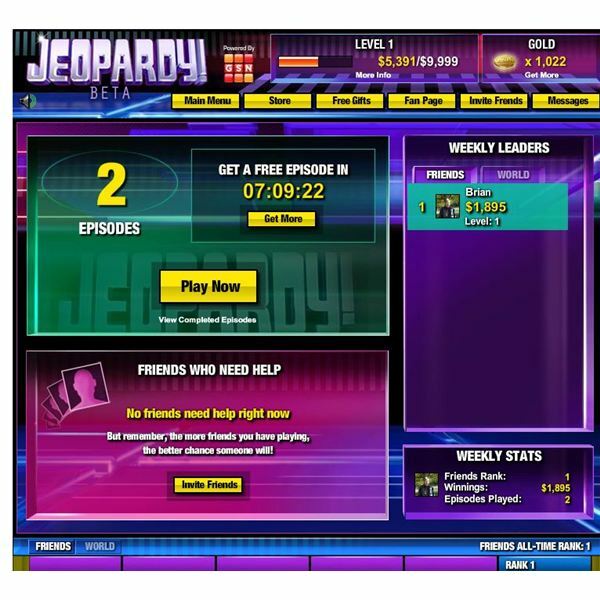 In the game, you can also help your friends answer questions in the final Jeopardy round. From the main screen, you can view weekly friend leaders and the world leaders in the game as well as your statistics such as episodes played. Once you are ready for a game you simple click the “play now button” and start your game of Jeopardy. Playing a game of Facebook Jeopardy is easy enough but it’s not quite like the T.V. show. You start with six categories assigned a dollar value. You don’t have multiple questions in each category just one. There’s a good mix of categories each time you play the game and you won’t see the same questions repeatedly. Some questions are quite easy while others will provide a good challenge for you. There’s a time clock for category selection and answering questions so you need to be quick with your selections. You can answer the question or use a boost to pass on the question. If you feel you know the answer, you can use a 2X multiplier boost, which will double your dollar value winnings. During game play, you’ll also encounter the famous daily double with a chance to double your earnings too. Once your board is cleared you’ll move onto double Jeopardy with double the prize values and naturally harder questions. As you play, you’ll win gold and you can use that gold to buy episodes, and boosts from the game store so you can keep playing the game and episodes can be purchased with Facebook credits too. Your goal in the game is to be better than your friends and pass them on the leader boards. Playing Jeopardy is easy and you’ll get used to the system in no time. Jeopardy has the same famous soundtrack during game play and it never gets tiresome. During game play, you’ll get the same sounds as the game show and during the final Jeopardy round the same familiar music. Overall, the sounds in the game are great. On the graphics side the game looks crisp and it loads quickly so you can begin to play right away. The game has a great interface and it’s easy to begin playing. There are tabs at the top of the screen for the game store, gifts, and messages from the game. On the multiplayer side, the game is a bit lacking. You can send Facebook friends gifts and see leader boards but it would be nice to play against other people. Maybe this feature could be added to the game in the future. You can send your friends multiplier boosts and pass boosts but that is it for gifts currently. The game does need some more multiplayer elements since this would just add to the overall game play of Jeopardy on Facebook. 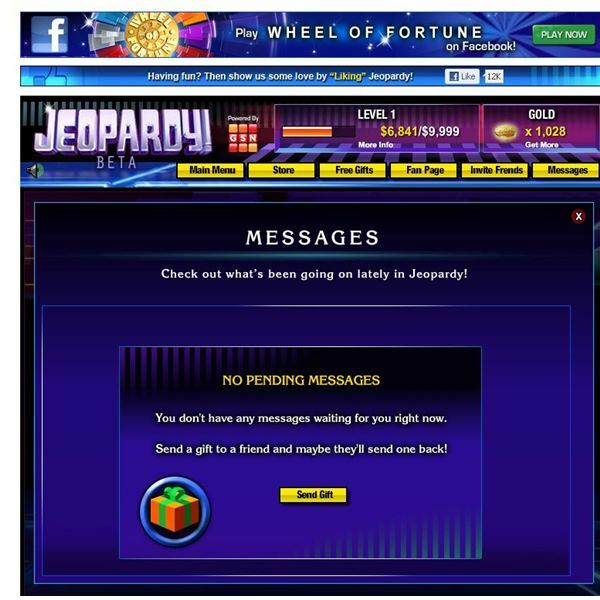 Jeopardy is a nice single player Facebook game and is perfect for those who follow the T.V. show or people who just like answering questions in general. The questions in the game are nice and varied with many different categories. You’ll find many popular T.V. 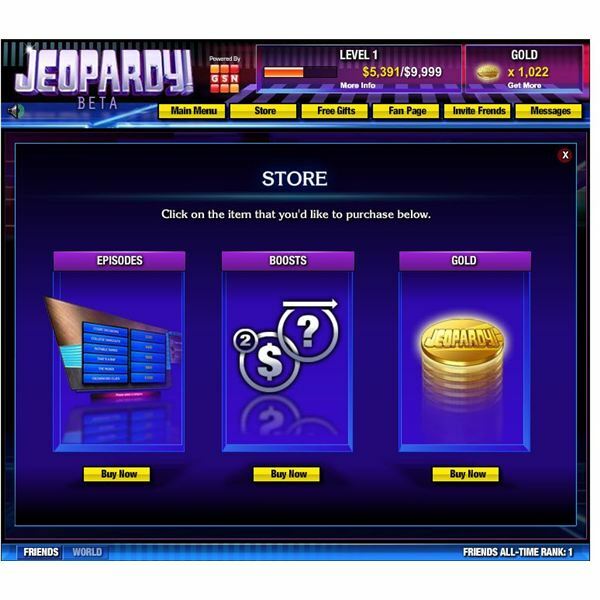 game shows now playable on Facebook and Jeopardy is another one added to the growing list. The game isn’t as good as the T.V. show and the multiplayer isn’t there but it’s a fun casual game to play when you have some spare time. You won’t be treated to the endless popups and messages like other Facebook games give you. This game will grow on you and Jeopardy on Facebook is well worth playing. All images from Jeopardy Facebook. Source: Article is author's own experiences playing Jeopardy on Facebook.